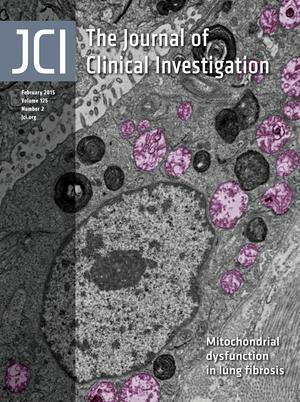 The cover image is a false-colored transmission electron micrograph of an alveolar type II cell from the lung of a patient with idiopathic pulmonary fibrosis. Dysmorphic, swollen mitochondria are shown in pink. On page 521, Bueno et al. report that mitochondrial dysfunction in alveolar type II cells promotes idiopathic pulmonary fibrosis. Citation Information: J Clin Invest. 2015;125(2):460-461. https://doi.org/10.1172/JCI80641. Citation Information: J Clin Invest. 2015;125(2):462-468. https://doi.org/10.1172/JCI68339. The necessary infrastructure to carry out genomics-driven oncology is now widely available and has resulted in the exponential increase in characterized cancer genomes. While a subset of genomic alterations is clinically actionable, the majority of somatic events remain classified as variants of unknown significance and will require functional characterization. A careful cataloging of the genomic alterations and their response to therapeutic intervention should allow the compilation of an “actionability atlas” and the creation of a genomic taxonomy stratified by tumor type and oncogenic pathway activation. The next phase of genomic medicine will therefore require talented bioinformaticians, genomic navigators, and multidisciplinary approaches to decode complex cancer genomes and guide potential therapy. Equally important will be the ethical and interpretable return of results to practicing oncologists. Finally, the integration of genomics into clinical trials is likely to speed the development of predictive biomarkers of response to targeted therapy as well as define pathways to acquired resistance. Citation Information: J Clin Invest. 2015;125(2):469-477. https://doi.org/10.1172/JCI75254. Activation of the inflammasome occurs in response to infection with a wide array of pathogenic microbes. The inflammasome serves as a platform to activate caspase-1, which results in the subsequent processing and secretion of the proinflammatory cytokines IL-1β and IL-18 and the initiation of an inflammatory cell death pathway termed pyroptosis. Effective inflammasome activation is essential in controlling pathogen replication as well as initiating adaptive immune responses against the offending pathogens. However, a number of pathogens have developed strategies to evade inflammasome activation. In this Review, we discuss these pathogen evasion strategies as well as the potential infectious complications of therapeutic blockade of IL-1 pathways. Citation Information: J Clin Invest. 2015;125(2):478-486. https://doi.org/10.1172/JCI78362. Brown adipose tissue (BAT), a specialized fat that dissipates energy to produce heat, plays an important role in the regulation of energy balance. Two types of thermogenic adipocytes with distinct developmental and anatomical features exist in rodents and humans: classical brown adipocytes and beige (also referred to as brite) adipocytes. While classical brown adipocytes are located mainly in dedicated BAT depots of rodents and infants, beige adipocytes sporadically reside with white adipocytes and emerge in response to certain environmental cues, such as chronic cold exposure, a process often referred to as “browning” of white adipose tissue. Recent studies indicate the existence of beige adipocytes in adult humans, making this cell type an attractive therapeutic target for obesity and obesity-related diseases, including type 2 diabetes. This Review aims to cover recent progress in our understanding of the anatomical, developmental, and functional characteristics of brown and beige adipocytes and discuss emerging questions, with a special emphasis on adult human BAT. Citation Information: J Clin Invest. 2015;125(2):487-489. https://doi.org/10.1172/JCI80420. Apoptosis is a metazoan process of controlled cell elimination that plays critical roles in embryonic development and adult tissue homeostasis. Apoptosis dysregulation contributes to several important diseases, including cancer. Two distinct yet interconnected signaling pathways control apoptosis by activating a core intracellular machinery of death proteases called caspases. The intrinsic apoptotic pathway engages caspases via members of the BCL-2 protein family and the mitochondria in reaction to severe cellular damage or stress. The extrinsic pathway activates caspases via cell-surface death receptors, which respond to cognate death ligands expressed on immune-effector cells. Tumor cells can acquire various apoptosis-evasion mechanisms; nevertheless, the transformed state of these cells makes them uniquely susceptible to apoptosis reactivation if resistance is circumvented. Molecular approaches to reengage the apoptotic pathways in cancer have been underway for over two decades. Gratifyingly, BCL-2 antagonists — which drive the intrinsic pathway — are beginning to bear clinical fruit. In contrast, clinical attempts to stimulate the extrinsic pathway with proapoptotic receptor agonists (PARAs) have been disappointing, despite compelling preclinical efficacy with this class of agents. Here, I discuss some of the possible reasons for this translational discrepancy and suggest strategies to overcome it with the next generation of PARAs. Citation Information: J Clin Invest. 2015;125(2):490-492. https://doi.org/10.1172/JCI79187. Neural centers in the hypothalamus regulate food intake and body weight in response to hormones and other neural stimuli, and dysfunctional communication between the brain and gut underlies metabolic disorders, including obesity. In this issue of the JCI, Steculorum and colleagues present evidence that the gastric peptide ghrelin mediates neural fiber growth in the arcuate nucleus of the hypothalamus during the neonatal period. Neonatal mice subjected to either increased or decreased ghrelin action during this developmental period had an increased risk of obesity in adulthood. Together, the results of this study support a model whereby neural organization at key stages of development sets the foundation for metabolic health later in life. Citation Information: J Clin Invest. 2015;125(2):493-494. https://doi.org/10.1172/JCI80279. Inflammatory conditions intensify and then resolve, often sparing and recovering some of the injured tissue. While the ebb and flow of inflammation can be followed in many tissues, there is not a great deal of information on how inflammation regresses in the brain. In this issue of the JCI, Walsh, Hendrix, and colleagues illuminate a cellular mechanism whereby T cells that infiltrate the brain after nerve crush or contusion actually protect neurons from injury. These infiltrating T cells produce IL-4 and do so independently of a classic adaptive T cell immune response. The T cells respond to mediators produced by damaged neurons, without the classic three-way interaction among antigen, the major histocompatibility complex, and the T cell receptor. After brain injury, these protective T cells produce IL-4, which attenuates damage via IL-4 receptors on neurons. Citation Information: J Clin Invest. 2015;125(2):495-497. https://doi.org/10.1172/JCI79188. Cancer cells exhibit altered metabolism compared with that of the surrounding tissue. There is hope that these reprogrammed metabolic pathways in tumors hold the key to advances for both cancer imaging and therapy. Translation of observations in cultured cancer cells to live tumors, however, has proven to be highly complex, and robust methods to analyze metabolic activity in primary human tumors are sorely needed. In this issue of the JCI, Sellers et al. use perioperative administration of isotope-labeled glucose to lung cancer patients to differentiate metabolic pathways between tumors and benign lung. They identify pyruvate carboxylation, a reaction that enables glucose-derived carbon to replenish TCA cycle intermediates, as a key component of anabolic metabolism in tumor cells. Citation Information: J Clin Invest. 2015;125(2):498-500. https://doi.org/10.1172/JCI80278. Spinobulbar muscular atrophy (SBMA) is an X-linked disease characterized by degeneration of motor neurons, muscle atrophy, and progressive weakness. It is caused by a polyglutamine (polyQ) expansion in the androgen receptor (AR), a transcription factor that is activated upon hormone binding. The polyQ expansion in AR causes it to form intracellular aggregates and impairs transcriptional activity. Intriguingly, SUMOylation (where SUMO indicates small ubiquitin-like modifier) of AR inhibits its transcriptional activity and reduces aggregation of the polyQ form of this protein, but it is unclear whether SUMOylation plays a pathogenic or protective role in SBMA. In this issue of the JCI, Chua et al. address this question by generating knockin mice in which the native AR is replaced by either a polyQ AR or a polyQ AR lacking the two lysine residues that are SUMOylated. The results from this study demonstrate that inhibiting SUMOylation of polyQ AR restores much of its transcriptional activity and prevents many (but not all) SBMA-associated symptoms in this mouse model. Citation Information: J Clin Invest. 2015;125(2):501-520. https://doi.org/10.1172/JCI73722. Nonalcoholic fatty liver disease (NAFLD) encompasses a range of manifestations, including steatosis and cirrhosis. Progressive disease is characterized by hepatic leukocyte accumulation in the form of steatohepatitis. The adhesion molecule vascular adhesion protein-1 (VAP-1) is a membrane-bound amine oxidase that promotes leukocyte recruitment to the liver, and the soluble form (sVAP-1) accounts for most circulating monoamine oxidase activity, has insulin-like effects, and can initiate oxidative stress. Here, we determined that hepatic VAP-1 expression is increased in patients with chronic liver disease and that serum sVAP-1 levels are elevated in patients with NAFLD compared with those in control individuals. In 4 murine hepatic injury models, an absence or blockade of functional VAP-1 reduced inflammatory cell recruitment to the liver and attenuated fibrosis. Moreover, disease was reduced in animals expressing a catalytically inactive form of VAP-1, implicating enzyme activity in the disease pathogenesis. Within the liver, hepatic stromal cells expressed functional VAP-1, and evaluation of cultured cells revealed that sVAP-1 promotes leukocyte migration through catalytic generation of ROS, which depended on VAP-1 enzyme activity. VAP-1 enhanced stromal cell spreading and wound closure and modulated expression of profibrotic genes. Together, these results link the amine oxidase activity of VAP-1 with hepatic inflammation and fibrosis and suggest that targeting VAP-1 has therapeutic potential for NAFLD and other chronic fibrotic liver diseases. Citation Information: J Clin Invest. 2015;125(2):521-538. https://doi.org/10.1172/JCI74942. Although aging is a known risk factor for idiopathic pulmonary fibrosis (IPF), the pathogenic mechanisms that underlie the effects of advancing age remain largely unexplained. Some age-related neurodegenerative diseases have an etiology that is related to mitochondrial dysfunction. Here, we found that alveolar type II cells (AECIIs) in the lungs of IPF patients exhibit marked accumulation of dysmorphic and dysfunctional mitochondria. These mitochondrial abnormalities in AECIIs of IPF lungs were associated with upregulation of ER stress markers and were recapitulated in normal mice with advancing age in response to stimulation of ER stress. We found that impaired mitochondria in IPF and aging lungs were associated with low expression of PTEN-induced putative kinase 1 (PINK1). Knockdown of PINK1 expression in lung epithelial cells resulted in mitochondria depolarization and expression of profibrotic factors. Moreover, young PINK1-deficient mice developed similarly dysmorphic, dysfunctional mitochondria in the AECIIs and were vulnerable to apoptosis and development of lung fibrosis. Our data indicate that PINK1 deficiency results in swollen, dysfunctional mitochondria and defective mitophagy, and promotes fibrosis in the aging lung. Citation Information: J Clin Invest. 2015;125(2):551-562. https://doi.org/10.1172/JCI78470. WNT signaling stimulates bone formation by increasing both the number of osteoblasts and their protein-synthesis activity. It is not clear how WNT augments the capacity of osteoblast progenitors to meet the increased energetic and synthetic needs associated with mature osteoblasts. Here, in cultured osteoblast progenitors, we determined that WNT stimulates glutamine catabolism through the tricarboxylic acid (TCA) cycle and consequently lowers intracellular glutamine levels. The WNT-induced reduction of glutamine concentration triggered a general control nonderepressible 2–mediated (GCN2-mediated) integrated stress response (ISR) that stimulated expression of genes responsible for amino acid supply, transfer RNA (tRNA) aminoacylation, and protein folding. WNT-induced glutamine catabolism and ISR were β-catenin independent, but required mammalian target of rapamycin complex 1 (mTORC1) activation. In a hyperactive WNT signaling mouse model of human osteosclerosis, inhibition of glutamine catabolism or Gcn2 deletion suppressed excessive bone formation. Together, our data indicate that glutamine is both an energy source and a protein-translation rheostat that is responsive to WNT and suggest that manipulation of the glutamine/GCN2 signaling axis may provide a valuable approach for normalizing deranged protein anabolism associated with human diseases. Citation Information: J Clin Invest. 2015;125(2):563-570. https://doi.org/10.1172/JCI78554. Mutations in the essential telomerase genes TERT and TR cause familial pulmonary fibrosis; however, in telomerase-null mice, short telomeres predispose to emphysema after chronic cigarette smoke exposure. Here, we tested whether telomerase mutations are a risk factor for human emphysema by examining their frequency in smokers with chronic obstructive pulmonary disease (COPD). Across two independent cohorts, we found 3 of 292 severe COPD cases carried deleterious mutations in TERT (1%). This prevalence is comparable to the frequency of alpha-1 antitrypsin deficiency documented in this population. The TERT mutations compromised telomerase catalytic activity, and mutation carriers had short telomeres. Telomerase mutation carriers with emphysema were predominantly female and had an increased incidence of pneumothorax. In families, emphysema showed an autosomal dominant inheritance pattern, along with pulmonary fibrosis and other telomere syndrome features, but manifested only in smokers. Our findings identify germline mutations in telomerase as a Mendelian risk factor for COPD susceptibility that clusters in autosomal dominant families with telomere-mediated disease including pulmonary fibrosis. Citation Information: J Clin Invest. 2015;125(2):571-582. https://doi.org/10.1172/JCI75183. While 30%–70% of RSV-infected infants develop bronchiolitis, 2% require hospitalization. It is not clear why disease severity differs among healthy, full-term infants; however, virus titers, inflammation, and Th2 bias are proposed explanations. While TLR4 is associated with these disease phenotypes, the role of this receptor in respiratory syncytial virus (RSV) pathogenesis is controversial. Here, we evaluated the interaction between TLR4 and environmental factors in RSV disease and defined the immune mediators associated with severe illness. Two independent populations of infants with RSV bronchiolitis revealed that the severity of RSV infection is determined by the TLR4 genotype of the individual and by environmental exposure to LPS. RSV-infected infants with severe disease exhibited a high GATA3/T-bet ratio, which manifested as a high IL-4/IFN-γ ratio in respiratory secretions. The IL-4/IFN-γ ratio present in infants with severe RSV is indicative of Th2 polarization. Murine models of RSV infection confirmed that LPS exposure, Tlr4 genotype, and Th2 polarization influence disease phenotypes. Together, the results of this study identify environmental and genetic factors that influence RSV pathogenesis and reveal that a high IL-4/IFN-γ ratio is associated with severe disease. Moreover, these molecules should be explored as potential targets for therapeutic intervention. Citation Information: J Clin Invest. 2015;125(2):593-606. https://doi.org/10.1172/JCI77780. Citation Information: J Clin Invest. 2015;125(2):607-620. https://doi.org/10.1172/JCI76972. Autosomal dominant polycystic kidney disease (ADPKD) is a common inherited nephropathy responsible for 4%–10% of end-stage renal disease cases. Mutations in the genes encoding polycystin-1 (PC1, PKD1) or polycystin-2 (PC2, PKD2) cause ADPKD, and PKD1 mutations are associated with more severe renal disease. PC1 has been shown to form a complex with PC2, and the severity of PKD1-mediated disease is associated with the level of the mature PC1 glycoform. Here, we demonstrated that PC1 and PC2 first interact in the ER before PC1 cleavage at the GPS/GAIN site and determined that PC2 acts as an essential chaperone for PC1 maturation and surface localization. The chaperone function of PC2 was dependent on the presence of the distal coiled-coil domain and was disrupted by pathogenic missense mutations. In Pkd2–/– mice, complete loss of PC2 prevented PC1 maturation. In Pkd2 heterozygotes, the 50% PC2 reduction resulted in a nonequimolar reduction (20%–25%) of the mature PC1 glycoform. Interbreeding between various Pkd1 and Pkd2 models revealed that animals with reduced levels of functional PC1 and PC2 in the kidney exhibited severe, rapidly progressive disease, illustrating the importance of complexing of these proteins for function. Our results indicate that PC2 regulates PC1 maturation; therefore, mature PC1 levels are a determinant of disease severity in PKD2 as well as PKD1. Citation Information: J Clin Invest. 2015;125(2):621-635. https://doi.org/10.1172/JCI78782. The gene encoding F-box protein FBXW7 is frequently mutated in many human cancers. Although most previous studies have focused on the tumor-suppressive capacity of FBXW7 in tumor cells themselves, we determined that FBXW7 in the host microenvironment also suppresses cancer metastasis. Deletion of Fbxw7 in murine BM-derived stromal cells induced accumulation of NOTCH and consequent transcriptional activation of Ccl2. FBXW7-deficient mice exhibited increased serum levels of the chemokine CCL2, which resulted in the recruitment of both monocytic myeloid-derived suppressor cells and macrophages, thereby promoting metastatic tumor growth. Administration of a CCL2 receptor antagonist blocked the enhancement of metastasis in FBXW7-deficient mice. Furthermore, in human breast cancer patients, FBXW7 expression in peripheral blood was associated with serum CCL2 concentration and disease prognosis. Together, these results suggest that FBXW7 antagonizes cancer development in not only a cell-autonomous manner, but also a non-cell-autonomous manner, and that modulation of the FBXW7/NOTCH/CCL2 axis may provide a potential approach to suppression of cancer metastasis. Citation Information: J Clin Invest. 2015;125(2):636-651. https://doi.org/10.1172/JCI77435. Citation Information: J Clin Invest. 2015;125(2):652-664. https://doi.org/10.1172/JCI77701. Vascular endothelial barrier dysfunction underlies diseases such as acute respiratory distress syndrome (ARDS), characterized by edema and inflammatory cell infiltration. The transcription factor HIF2α is highly expressed in vascular endothelial cells (ECs) and may regulate endothelial barrier function. Here, we analyzed promoter sequences of genes encoding proteins that regulate adherens junction (AJ) integrity and determined that vascular endothelial protein tyrosine phosphatase (VE-PTP) is a HIF2α target. HIF2α-induced VE-PTP expression enhanced dephosphorylation of VE-cadherin, which reduced VE-cadherin endocytosis and thereby augmented AJ integrity and endothelial barrier function. Mice harboring an EC-specific deletion of Hif2a exhibited decreased VE-PTP expression and increased VE-cadherin phosphorylation, resulting in defective AJs. Mice lacking HIF2α in ECs had increased lung vascular permeability and water content, both of which were further exacerbated by endotoxin-mediated injury. Treatment of these mice with Fg4497, a prolyl hydroxylase domain 2 (PHD2) inhibitor, activated HIF2α-mediated transcription in a hypoxia-independent manner. HIF2α activation increased VE-PTP expression, decreased VE-cadherin phosphorylation, promoted AJ integrity, and prevented the loss of endothelial barrier function. These findings demonstrate that HIF2α enhances endothelial barrier integrity, in part through VE-PTP expression and the resultant VE-cadherin dephosphorylation-mediated assembly of AJs. Moreover, activation of HIF2α/VE-PTP signaling via PHD2 inhibition has the potential to prevent the formation of leaky vessels and edema in inflammatory diseases such as ARDS. Citation Information: J Clin Invest. 2015;125(2):665-680. https://doi.org/10.1172/JCI78253. Cellular lipid metabolism has been linked to immune responses; however, the precise mechanisms by which de novo fatty acid synthesis can regulate inflammatory responses remain unclear. The NLRP3 inflammasome serves as a platform for caspase-1–dependent maturation and secretion of proinflammatory cytokines. Here, we demonstrated that the mitochondrial uncoupling protein-2 (UCP2) regulates NLRP3-mediated caspase-1 activation through the stimulation of lipid synthesis in macrophages. UCP2-deficient mice displayed improved survival in a mouse model of polymicrobial sepsis. Moreover, UCP2 expression was increased in human sepsis. Consistently, UCP2-deficient mice displayed impaired lipid synthesis and decreased production of IL-1β and IL-18 in response to LPS challenge. In macrophages, UCP2 deficiency suppressed NLRP3-mediated caspase-1 activation and NLRP3 expression associated with inhibition of lipid synthesis. In UCP2-deficient macrophages, inhibition of lipid synthesis resulted from the downregulation of fatty acid synthase (FASN), a key regulator of fatty acid synthesis. FASN inhibition by shRNA and treatment with the chemical inhibitors C75 and cerulenin suppressed NLRP3-mediated caspase-1 activation and inhibited NLRP3 and pro–IL-1β gene expression in macrophages. In conclusion, our results suggest that UCP2 regulates the NLRP3 inflammasome by inducing the lipid synthesis pathway in macrophages. These results identify UCP2 as a potential therapeutic target in inflammatory diseases such as sepsis. Citation Information: J Clin Invest. 2015;125(2):681-686. https://doi.org/10.1172/JCI78421. Tau is a highly abundant and multifunctional brain protein that accumulates in neurofibrillary tangles (NFTs), most commonly in Alzheimer’s disease (AD) and primary age-related tauopathy. Recently, microRNAs (miRNAs) have been linked to neurodegeneration; however, it is not clear whether miRNA dysregulation contributes to tau neurotoxicity. Here, we determined that the highly conserved brain miRNA miR-219 is downregulated in brain tissue taken at autopsy from patients with AD and from those with severe primary age-related tauopathy. In a Drosophila model that produces human tau, reduction of miR-219 exacerbated tau toxicity, while overexpression of miR-219 partially abrogated toxic effects. Moreover, we observed a bidirectional modulation of tau levels in the Drosophila model that was dependent on miR-219 expression or neutralization, demonstrating that miR-219 regulates tau in vivo. In mammalian cellular models, we found that miR-219 binds directly to the 3′-UTR of the tau mRNA and represses tau synthesis at the post-transcriptional level. Together, our data indicate that silencing of tau by miR-219 is an ancient regulatory mechanism that may become perturbed during neurofibrillary degeneration and suggest that this regulatory pathway may be useful for developing therapeutics for tauopathies. Citation Information: J Clin Invest. 2015;125(2):687-698. https://doi.org/10.1172/JCI72873. Anabolic biosynthesis requires precursors supplied by the Krebs cycle, which in turn requires anaplerosis to replenish precursor intermediates. The major anaplerotic sources are pyruvate and glutamine, which require the activity of pyruvate carboxylase (PC) and glutaminase 1 (GLS1), respectively. Due to their rapid proliferation, cancer cells have increased anabolic and energy demands; however, different cancer cell types exhibit differential requirements for PC- and GLS-mediated pathways for anaplerosis and cell proliferation. Here, we infused patients with early-stage non–small-cell lung cancer (NSCLC) with uniformly 13C-labeled glucose before tissue resection and determined that the cancerous tissues in these patients had enhanced PC activity. Freshly resected paired lung tissue slices cultured in 13C6-glucose or 13C5,15N2-glutamine tracers confirmed selective activation of PC over GLS in NSCLC. Compared with noncancerous tissues, PC expression was greatly enhanced in cancerous tissues, whereas GLS1 expression showed no trend. Moreover, immunohistochemical analysis of paired lung tissues showed PC overexpression in cancer cells rather than in stromal cells of tumor tissues. PC knockdown induced multinucleation, decreased cell proliferation and colony formation in human NSCLC cells, and reduced tumor growth in a mouse xenograft model. Growth inhibition was accompanied by perturbed Krebs cycle activity, inhibition of lipid and nucleotide biosynthesis, and altered glutathione homeostasis. These findings indicate that PC-mediated anaplerosis in early-stage NSCLC is required for tumor survival and proliferation. Citation Information: J Clin Invest. 2015;125(2):699-714. https://doi.org/10.1172/JCI76210. A body of experimental evidence suggests that T cells mediate neuroprotection following CNS injury; however, the antigen specificity of these T cells and how they mediate neuroprotection are unknown. Here, we have provided evidence that T cell–mediated neuroprotection after CNS injury can occur independently of major histocompatibility class II (MHCII) signaling to T cell receptors (TCRs). Using two murine models of CNS injury, we determined that damage-associated molecular mediators that originate from injured CNS tissue induce a population of neuroprotective, IL-4–producing T cells in an antigen-independent fashion. Compared with wild-type mice, IL-4–deficient animals had decreased functional recovery following CNS injury; however, transfer of CD4+ T cells from wild-type mice, but not from IL-4–deficient mice, enhanced neuronal survival. Using a culture-based system, we determined that T cell–derived IL-4 protects and induces recovery of injured neurons by activation of neuronal IL-4 receptors, which potentiated neurotrophin signaling via the AKT and MAPK pathways. Together, these findings demonstrate that damage-associated molecules from the injured CNS induce a neuroprotective T cell response that is independent of MHCII/TCR interactions and is MyD88 dependent. Moreover, our results indicate that IL-4 mediates neuroprotection and recovery of the injured CNS and suggest that strategies to enhance IL-4–producing CD4+ T cells have potential to attenuate axonal damage in the course of CNS injury in trauma, inflammation, or neurodegeneration. Citation Information: J Clin Invest. 2015;125(2):715-726. https://doi.org/10.1172/JCI77632. Acute kidney injury (AKI) is a public health concern with an annual mortality rate that exceeds those of breast and prostate cancer, heart failure, and diabetes combined. Oxidative stress and mitochondrial damage are drivers of AKI-associated pathology; however, the pathways that mediate these events are poorly defined. Here, using a murine cisplatin-induced AKI model, we determined that both oxidative stress and mitochondrial damage are associated with reduced levels of renal sirtuin 3 (SIRT3). Treatment with the AMPK agonist AICAR or the antioxidant agent acetyl-l-carnitine (ALCAR) restored SIRT3 expression and activity, improved renal function, and decreased tubular injury in WT animals, but had no effect in Sirt3–/– mice. Moreover, Sirt3-deficient mice given cisplatin experienced more severe AKI than WT animals and died, and neither AICAR nor ALCAR treatment prevented death in Sirt3–/– AKI mice. In cultured human tubular cells, cisplatin reduced SIRT3, resulting in mitochondrial fragmentation, while restoration of SIRT3 with AICAR and ALCAR improved cisplatin-induced mitochondrial dysfunction. Together, our results indicate that SIRT3 is protective against AKI and suggest that enhancing SIRT3 to improve mitochondrial dynamics has potential as a strategy for improving outcomes of renal injury. Citation Information: J Clin Invest. 2015;125(2):727-738. https://doi.org/10.1172/JCI79651. Mutations in the cellular retinaldehyde–binding protein (CRALBP, encoded by RLBP1) can lead to severe cone photoreceptor–mediated vision loss in patients. It is not known how CRALBP supports cone function or how altered CRALBP leads to cone dysfunction. Here, we determined that deletion of Rlbp1 in mice impairs the retinal visual cycle. Mice lacking CRALBP exhibited M-opsin mislocalization, M-cone loss, and impaired cone-driven visual behavior and light responses. Additionally, M-cone dark adaptation was largely suppressed in CRALBP-deficient animals. While rearing CRALBP-deficient mice in the dark prevented the deterioration of cone function, it did not rescue cone dark adaptation. Adeno-associated virus–mediated restoration of CRALBP expression specifically in Müller cells, but not retinal pigment epithelial (RPE) cells, rescued the retinal visual cycle and M-cone sensitivity in knockout mice. Our results identify Müller cell CRALBP as a key component of the retinal visual cycle and demonstrate that this pathway is important for maintaining normal cone–driven vision and accelerating cone dark adaptation. Citation Information: J Clin Invest. 2015;125(2):739-751. https://doi.org/10.1172/JCI74894. The composition of tumor-targeted T cell infiltrates is a major prognostic factor in colorectal cancer (CRC) outcome; however, the functional role of these populations in prolonging patient survival remains unclear. Here, we evaluated 190 patients with CRC for the presence of functionally active tumor-infiltrating lymphocytes (TILs), the tumor specificity of these TILs, and the correlation between patient TILs and long-term survival. Using intracytoplasmic cytokine staining in conjunction with HLA multimers loaded with tumor peptide and antigen-specific cytokine secretion assays, we determined that TNF-α expression delineates a population of tumor antigen–specific (TA-specific) cytotoxic T lymphocytes (CTLs) present within tumors from patients with CRC. Upregulation of TNF-α expression in TILs strongly correlated with an increase in the total amount of intratumoral TNF-α, which is indicative of tumor-specific CTL activity. Moreover, a retrospective multivariate analysis of 102 patients with CRC, which had multiple immune parameters evaluated, revealed that increased TNF-α concentration was an independent prognostic factor. Together, these results indicate that the prognostic impact of T cell infiltrates for CRC maybe largely based on subpopulations of active TA-specific T cells within the tumor, suggesting causal implication for these cells in patient survival. Additionally, these results support the use of intratumoral TNF-α, which is indicative of T cell function, as a prognostic parameter for CRC. Citation Information: J Clin Invest. 2015;125(2):752-768. https://doi.org/10.1172/JCI77014. The phagocytosis of apoptotic cells and associated vesicles (efferocytosis) by DCs is an important mechanism for both self tolerance and host defense. Although some of the engulfment ligands involved in efferocytosis have been identified and studied in vitro, the contributions of these ligands in vivo remain ill defined. Here, we determined that during Mycobacterium tuberculosis (Mtb) infection, the engulfment ligand annexin1 is an important mediator in DC cross-presentation that increases efferocytosis in DCs and intrinsically enhances the capacity of the DC antigen–presenting machinery. Annexin1-deficient mice were highly susceptible to Mtb infection and showed an impaired Mtb antigen–specific CD8+ T cell response. Importantly, annexin1 expression was greatly downregulated in Mtb-infected human blood monocyte–derived DCs, indicating that reduction of annexin1 is a critical mechanism for immune evasion by Mtb. Collectively, these data indicate that annexin1 is essential in immunity to Mtb infection and mediates the power of DC efferocytosis and cross-presentation. Citation Information: J Clin Invest. 2015;125(2):769-781. https://doi.org/10.1172/JCI77588. The current treatment for patients with hypothyroidism is levothyroxine (L-T4) along with normalization of serum thyroid-stimulating hormone (TSH). However, normalization of serum TSH with L-T4 monotherapy results in relatively low serum 3,5,3′-triiodothyronine (T3) and high serum thyroxine/T3 (T4/T3) ratio. In the hypothalamus-pituitary dyad as well as the rest of the brain, the majority of T3 present is generated locally by T4 deiodination via the type 2 deiodinase (D2); this pathway is self-limited by ubiquitination of D2 by the ubiquitin ligase WSB-1. Here, we determined that tissue-specific differences in D2 ubiquitination account for the high T4/T3 serum ratio in adult thyroidectomized (Tx) rats chronically implanted with subcutaneous L-T4 pellets. While L-T4 administration decreased whole-body D2-dependent T4 conversion to T3, D2 activity in the hypothalamus was only minimally affected by L-T4. In vivo studies in mice harboring an astrocyte-specific Wsb1 deletion as well as in vitro analysis of D2 ubiquitination driven by different tissue extracts indicated that D2 ubiquitination in the hypothalamus is relatively less. As a result, in contrast to other D2-expressing tissues, the hypothalamus is wired to have increased sensitivity to T4. These studies reveal that tissue-specific differences in D2 ubiquitination are an inherent property of the TRH/TSH feedback mechanism and indicate that only constant delivery of L-T4 and L-T3 fully normalizes T3-dependent metabolic markers and gene expression profiles in Tx rats. Citation Information: J Clin Invest. 2015;125(2):782-786. https://doi.org/10.1172/JCI78361. Satiety and other core physiological functions are modulated by sensory signals arising from the surface of the gut. Luminal nutrients and bacteria stimulate epithelial biosensors called enteroendocrine cells. Despite being electrically excitable, enteroendocrine cells are generally thought to communicate indirectly with nerves through hormone secretion and not through direct cell-nerve contact. However, we recently uncovered in intestinal enteroendocrine cells a cytoplasmic process that we named neuropod. Here, we determined that neuropods provide a direct connection between enteroendocrine cells and neurons innervating the small intestine and colon. Using cell-specific transgenic mice to study neural circuits, we found that enteroendocrine cells have the necessary elements for neurotransmission, including expression of genes that encode pre-, post-, and transsynaptic proteins. This neuroepithelial circuit was reconstituted in vitro by coculturing single enteroendocrine cells with sensory neurons. We used a monosynaptic rabies virus to define the circuit’s functional connectivity in vivo and determined that delivery of this neurotropic virus into the colon lumen resulted in the infection of mucosal nerves through enteroendocrine cells. This neuroepithelial circuit can serve as both a sensory conduit for food and gut microbes to interact with the nervous system and a portal for viruses to enter the enteric and central nervous systems. Citation Information: J Clin Invest. 2015;125(2):787-795. https://doi.org/10.1172/JCI78425. BACKGROUND. Obesity is associated with insulin resistance and increased intrahepatic triglyceride (IHTG) content, both of which are key risk factors for diabetes and cardiovascular disease. However, a subset of obese people does not develop these metabolic complications. Here, we tested the hypothesis that people defined by IHTG content and insulin sensitivity as “metabolically normal obese” (MNO), but not those defined as “metabolically abnormal obese” (MAO), are protected from the adverse metabolic effects of weight gain. METHODS. Body composition, multiorgan insulin sensitivity, VLDL apolipoprotein B100 (apoB100) kinetics, and global transcriptional profile in adipose tissue were evaluated before and after moderate (~6%) weight gain in MNO (n = 12) and MAO (n = 8) subjects with a mean BMI of 36 ± 4 kg/m2 who were matched for BMI and fat mass. RESULTS. Although the increase in body weight and fat mass was the same in both groups, hepatic, skeletal muscle, and adipose tissue insulin sensitivity deteriorated, and VLDL apoB100 concentrations and secretion rates increased in MAO, but not MNO, subjects. Moreover, biological pathways and genes associated with adipose tissue lipogenesis increased in MNO, but not MAO, subjects. CONCLUSIONS. These data demonstrate that MNO people are resistant, whereas MAO people are predisposed, to the adverse metabolic effects of moderate weight gain and that increased adipose tissue capacity for lipogenesis might help protect MNO people from weight gain–induced metabolic dysfunction. FUNDING. This work was supported by NIH grants UL1 RR024992 (Clinical Translational Science Award), DK 56341 (Nutrition and Obesity Research Center), DK 37948 and DK 20579 (Diabetes Center Grant), and UL1 TR000450 (KL2 Award); a Central Society for Clinical and Translational Research Early Career Development Award; and by grants from the Longer Life Foundation and the Kilo Foundation. Citation Information: J Clin Invest. 2015;125(2):796-808. https://doi.org/10.1172/JCI79220. Citation Information: J Clin Invest. 2015;125(2):809-823. https://doi.org/10.1172/JCI77186. Osteoclasts are bone-resorbing cells that are important for maintenance of bone remodeling and mineral homeostasis. Regulation of osteoclast differentiation and activity is important for the pathogenesis and treatment of diseases associated with bone loss. Here, we demonstrate that retinoid X receptors (RXRs) are key elements of the transcriptional program of differentiating osteoclasts. Loss of RXR function in hematopoietic cells resulted in formation of giant, nonresorbing osteoclasts and increased bone mass in male mice and protected female mice from bone loss following ovariectomy, which induces osteoporosis in WT females. The increase in bone mass associated with RXR deficiency was due to lack of expression of the RXR-dependent transcription factor v-maf musculoaponeurotic fibrosarcoma oncogene family, protein B (MAFB) in osteoclast progenitors. Evaluation of osteoclast progenitor cells revealed that RXR homodimers directly target and bind to the Mafb promoter, and this interaction is required for proper osteoclast proliferation, differentiation, and activity. Pharmacological activation of RXRs inhibited osteoclast differentiation due to the formation of RXR/liver X receptor (LXR) heterodimers, which induced expression of sterol regulatory element binding protein-1c (SREBP-1c), resulting in indirect MAFB upregulation. Our study reveals that RXR signaling mediates bone homeostasis and suggests that RXRs have potential as targets for the treatment of bone pathologies such as osteoporosis. Citation Information: J Clin Invest. 2015;125(2):824-830. https://doi.org/10.1172/JCI78185. NOTCH signaling suppresses tumor growth and proliferation in several types of stratified epithelia. Here, we show that missense mutations in NOTCH1 and NOTCH2 found in human bladder cancers result in loss of function. In murine models, genetic ablation of the NOTCH pathway accelerated bladder tumorigenesis and promoted the formation of squamous cell carcinomas, with areas of mesenchymal features. Using bladder cancer cells, we determined that the NOTCH pathway stabilizes the epithelial phenotype through its effector HES1 and, consequently, loss of NOTCH activity favors the process of epithelial-mesenchymal transition. Evaluation of human bladder cancer samples revealed that tumors with low levels of HES1 present mesenchymal features and are more aggressive. Together, our results indicate that NOTCH serves as a tumor suppressor in the bladder and that loss of this pathway promotes mesenchymal and invasive features. Citation Information: J Clin Invest. 2015;125(2):831-845. https://doi.org/10.1172/JCI73214. Expansion of the polyglutamine (polyQ) tract within the androgen receptor (AR) causes neuromuscular degeneration in individuals with spinobulbar muscular atrophy (SBMA). PolyQ AR has diminished transcriptional function and exhibits ligand-dependent proteotoxicity, features that have both been implicated in SBMA; however, the extent to which altered AR transcriptional function contributes to pathogenesis remains controversial. Here, we sought to dissociate effects of diminished AR function from polyQ-mediated proteotoxicity by enhancing the transcriptional activity of polyQ AR. To accomplish this, we bypassed the inhibitory effect of AR SUMOylation (where SUMO indicates small ubiquitin-like modifier) by mutating conserved lysines in the polyQ AR that are sites of SUMOylation. We determined that replacement of these residues by arginine enhances polyQ AR activity as a hormone-dependent transcriptional regulator. In a murine model, disruption of polyQ AR SUMOylation rescued exercise endurance and type I muscle fiber atrophy; it also prolonged survival. These changes occurred without overt alterations in polyQ AR expression or aggregation, revealing the favorable trophic support exerted by the ligand-activated receptor. Our findings demonstrate beneficial effects of enhancing the transcriptional function of the ligand-activated polyQ AR and indicate that the SUMOylation pathway may be a potential target for therapeutic intervention in SBMA. Citation Information: J Clin Invest. 2015;125(2):846-858. https://doi.org/10.1172/JCI73688. A complex neural network regulates body weight and energy balance, and dysfunction in the communication between the gut and this neural network is associated with metabolic diseases, such as obesity. The stomach-derived hormone ghrelin stimulates appetite through interactions with neurons in the arcuate nucleus of the hypothalamus (ARH). Here, we evaluated the physiological and neurobiological contribution of ghrelin during development by specifically blocking ghrelin action during early postnatal development in mice. Ghrelin blockade in neonatal mice resulted in enhanced ARH neural projections and long-term metabolic effects, including increased body weight, visceral fat, and blood glucose levels and decreased leptin sensitivity. In addition, chronic administration of ghrelin during postnatal life impaired the normal development of ARH projections and caused metabolic dysfunction. Consistent with these observations, direct exposure of postnatal ARH neuronal explants to ghrelin blunted axonal growth and blocked the neurotrophic effect of the adipocyte-derived hormone leptin. Moreover, chronic ghrelin exposure in neonatal mice also attenuated leptin-induced STAT3 signaling in ARH neurons. Collectively, these data reveal that ghrelin plays an inhibitory role in the development of hypothalamic neural circuits and suggest that proper expression of ghrelin during neonatal life is pivotal for lifelong metabolic regulation. Citation Information: J Clin Invest. 2015;125(2):859-869. https://doi.org/10.1172/JCI79014. Molecular chaperones control a multitude of cellular functions via folding chaperone-specific client proteins. CD4+FOXP3+ Tregs play key roles in maintaining peripheral tolerance, which is subject to regulation by multiple molecular switches, including mTOR and hypoxia-inducible factor. It is not clear whether GP96 (also known as GRP94), which is a master TLR and integrin chaperone, controls Treg function. Using murine genetic models, we demonstrated that GP96 is required for Treg maintenance and function, as loss of GP96 resulted in instability of the Treg lineage and impairment of suppressive functions in vivo. In the absence of GP96, Tregs were unable to maintain FOXP3 expression levels, resulting in systemic accumulation of pathogenic IFN-γ–producing and IL-17–producing T cells. We determined that GP96 serves as an essential chaperone for the cell-surface protein glycoprotein A repetitions predominant (GARP), which is a docking receptor for latent membrane–associated TGF-β (mLTGF-β). The loss of both GARP and integrins on GP96-deficient Tregs prevented expression of mLTGF-β and resulted in inefficient production of active TGF-β. Our work demonstrates that GP96 regulates multiple facets of Treg biology, thereby placing Treg stability and immunosuppressive functions strategically under the control of a major stress chaperone. Citation Information: J Clin Invest. 2015;125(2):870-880. https://doi.org/10.1172/JCI79213. Citation Information: J Clin Invest. 2015;125(2):881-881. https://doi.org/10.1172/JCI80031. Citation Information: J Clin Invest. 2015;125(2):882-882. https://doi.org/10.1172/JCI80814.